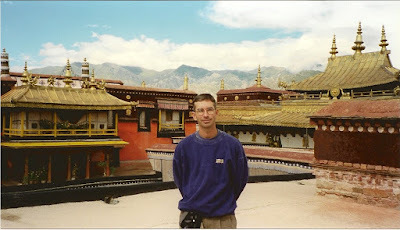 We have traveled to Lhasa, the capital city of Tibet, twice on our round the world journeys. It is one of the most interesting destinations on earth for a variety of reasons: a colorful culture that was, until recently, unspoiled by the outside world; exquisite Buddhist temples and fabled monasteries; the country’s distinctive natural and architectural beauty; and perhaps the most devout people on the planet. Sadly, thought, many of the treasures that make this wondrous place extraordinary are quickly disappearing. Perched on a high mountain plateau, Lhasa is the administrative capital of the Tibet Autonomous Region in the People’s Republic of China, and was the traditional seat of power for the Dalai Lama until the Chinese invasion in 1959. Lhasa is to Tibetan Buddhists, what Rome is to Catholics. Lhasa literally means “place of the gods,” and is the myth-shrouded, holy center of Tibet, with a population of just under 300,000. On our first visit, even the drive from Gongkar Airport to Lhasa turned into an interesting adventure. The road winds over moonscape-like valleys where ox and yak graze, barley crops sway in the wind, and squat, stone, and mud farmhouses dot the countryside. Each house, had a set of yak horns set over the door frames for protection, and suspended from poles and outcroppings of rock were strings of prayer flags, the five-color flags symbolize sky (blue), clouds (white), fire (red), water (green) and earth (yellow). Our driver stopped at one farm where we toured the house and were served yak-butter tea (which tastes exactly like it sounds: buttery and yakky). It was a single room house that embraced a courtyard filled with livestock and hand-made, wooden farm tools. Dotting the whitewashed, courtyard walls were paddies of cow and yak dung, drying in the strong sun. 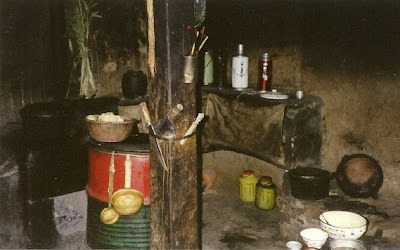 Living at or above tree-line, farmers use dry dung as fuel to cook meals and warm their houses. With the help of our interpreter, we had an opportunity to talk to the farmers. 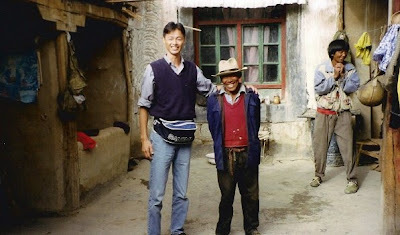 What we found was consistent with almost everyone we met in Lhasa: living in the cold, high desert, hemmed in by two mountain ranges of the world’s highest peaks, have made the Tibetan people austere, pragmatic, tenacious independent, and pious, yet they are also taciturn and shy. Lhasa has been called the Rooftop of the World, perched on a desert plateau 12,000 feet above sea level and surrounded by 18,000-foot mountain peaks. After checking into to the only tourist-class hotel in the city for foreigners at the time, a Holiday Inn of all things, we decided to get our bearings by walking from our hotel to the center of town. We hadn’t really felt the altitude until, walking on level streets, we could only stroll half a block before needing to sit down and catch our breath. Any activity and we immediately felt the effects of the altitude. Even with little activity, I experienced a low-grade headache for the first week that painkillers had no effect on. The local open-air market in the center of town was typical of markets all over Asia except that the hand-made handicrafts were all of an exceptional quality. As we wandered through the stalls, we were mesmerized by lines of burgundy-robed monks chanting ancient sutras, devout pilgrims prostrating themselves full length on the ground and mumbling prayers, and an army of dark-headed, smiling kids selling everything from chewing gum and prayer wheels, to lavishly engraved swords. The holiest ground in Tibet is the Jokhang temple sitting smack in the middle of Barkor Square in the city center. Before entering the Jokhang, we fell in with the procession of pilgrims that perambulate clockwise around the building. Three revolutions brought us to a standstill before the Jokhang’s broad front doors. We had to gingerly step between dozens of prostrating pilgrims before entering the temple to see the Jowo Sakyamuni, Tibet’s most revered image. It’s an impressive statue with a magnificent crown of gold, coral and turquoise. As impressive as the statue is, it was the building itself that most impressed me, with carved wooden ceilings and beautiful murals. I was also impressed with the almost circus-like atmosphere created by the chanting monks and praying worshipers. 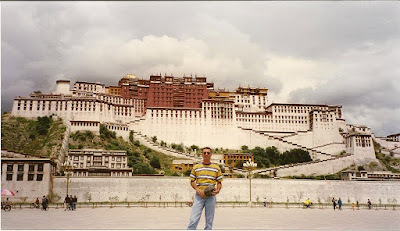 Next we visited the crown jewel of Tibet, the Potala Palace, home of the Dalai Lama until the Chinese invasion in 1959. While other Tibetan monuments are more significant in religious terms, the Potala Palace is the most enduring symbol of Tibet. The palace was one of the few monasteries that was protected by the Chinese Army during the invasion, and also during the Cultural Revolution. As a result, most of its treasures remain intact and virtually unchanged since the 17th century. The palace stands thirteen stories tall, and boasts of over a 1,000 rooms and chapels with 10,000 shrines and 200,000 images of the Buddha. Our guide led us through a maze of room were the remains of previous Dalai Lama’s were enshrined in fabulous stupas, to an upper floor where the tomb of the 13th Dalai Lama rests. This 46 foot high stupa contains priceless jewels and a ton of solid gold. Devotional offerings in that room included elephant tusks from India, porcelain lions, vases and a pagoda made with over 200,000 pearls. It was in this chapel that we were granted an audience with a monk, who spoke to us about the dharma, blessed us with a prayer, and slipped silk scarves around our necks. On our first visit to Lhasa, the Palace was still a place of worship and was visited daily by hundreds of pilgrims. The Potala’s dim rooms and hallways, many of which are lit only by butter-lamps, evoke the surreal mysticism associated with Tibetan Buddhism. 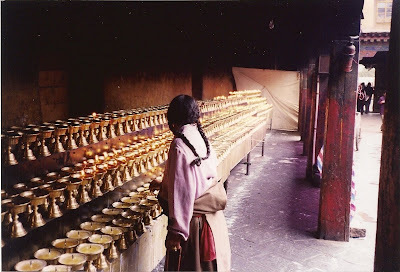 Rough-clad pilgrims crowded into the chapels, pouring Yak butter from thermoses into huge bowls to feed the lamps, which in turn illuminate the massive Buddha images. As impressive as these statues and shrines are, it was the awed, devout faces of the pilgrims gazing up at them that overwhelmed me. On our second visit to Lhasa, just two years later, the Potala Palace had been converted into a museum by the Chinese government. Gone were the monks, gone were the pilgrims, gone were many of the treasures. This symbol of Tibetan Buddhism had been reduced to a tourist trap, and more recently, it had so many visitors each day that to protect the site, entrance was limited to 2,500 tourists per day. This was typical of many other changes that we saw, most of which, to my way of thinking, spelled the end of a culture. On that second visit, we found that landmarks had been demolished and twisting lanes were replaced by broad boulevards. Most of the local street vendors selling food were no longer there, but there were several new AAA approved restaurants and cafes along the main boulevard. For and five story steel and glass office building dotted the main roads and there were three additional tourist hotels with more under construction. What once had been a shabby, yet colorful, shopping district was filled with clean and modern new stores. The monks and pilgrims were forced to worship at a few temples inside the city and lesser monasteries outside the city limits. The cause of all this change, this modernization, was the Chinese government moving in hoards of Han and Hui Chinese from other provinces of China. 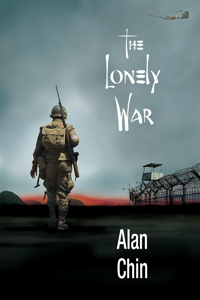 It was clear the government meant to quell the rebellions Tibetans by diluting them in a sea of loyal Chinese people. That influx of outsiders rapidly increased after the opening of the railway that now connects Beijing with Lhasa. The exiled Tibetan government and reputable Western newspapers assert that Tibetans are now a minority in Lhasa. I’m not suggesting this is bad for Lhasa. 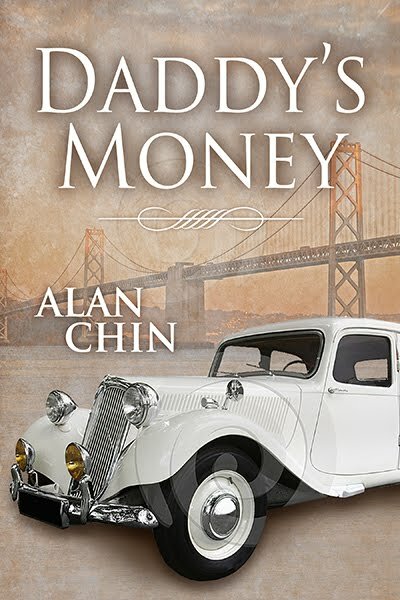 Certainly the influx of Chinese has brought new wealth and prosperity to the city’s population, and living conditions have dramatically improved for much of the residents. But make no mistake, the Tibetan people, at least the ones in Lhasa, are indeed losing their culture and what they hold most dear. 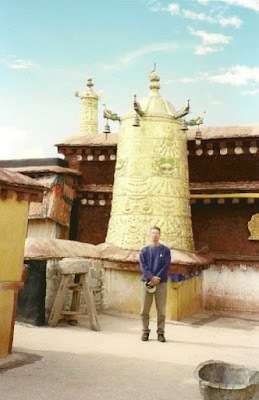 *Memories: Yak Butter Tea, Oxygen tanks in the room, and pinched by a monk.